A ferocious March storm could produce everything from blizzards to tornadoes over parts of the Midwest Tuesday. CBS Early Show meteorologist Dave Price says a dangerous storm with heavy snow is headed for the Dakotas and Minnesota Tuesday, with blizzard conditions expected in the early to mid-afternoon. Sustained winds of 25 to 35 mph with gusts of up to 40 mph or even greater, will propel snow that could reach one foot. The National Weather Service says northwestern Minnesota could see up to five inches of snow by late afternoon. Temperatures could fall to 10 below zero by Wednesday morning. Price says with wind chill temperatures will be down in the -20° to -40° degree range. Forecasters say another wave of heavy snow could fall across much of western and central Minnesota into the northeastern part of the state starting tomorrow. More than six inches of snow is possible in many parts of central and northeastern Minnesota. Fargo, N.D., woke up to three inches of snow and is expecting another 10 inches Tuesday. "This sounds like the real deal," Highway Patrol Capt. Jim Prochniak said. High winds reduced visibility and icy roads made driving deadly. Interstate 94 from Jamestown to Fargo was closed Monday night after a day of icy roads. National Weather Service officials said more than 3 inches of snow fell in eastern North Dakota on Monday, on top of freezing rain. "The interstate is absolutely iced over and speeds are down to 20-25 mph in daylight hours, so with reduced visibility it's going to be absolutely terrible, terrible," said Sgt. Troy Hischer of the Highway Patrol. An ambulance carrying a seriously ill patient from Carrington to Fargo rolled over near Casselton, killing the patient and injuring the driver and paramedic. "They had their lights on and were following all protocol," said Brenda Rask, a spokeswoman for the Carrington hospital. 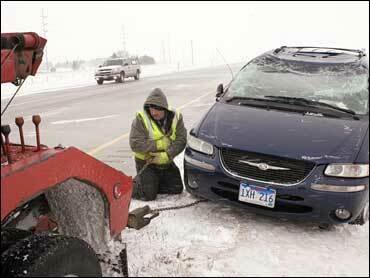 "The road conditions changed as they got closer to Fargo. Unfortunately, they ended up being victims, themselves." The crash killed Kenneth Kandt, 66, of Fessenden. The paramedic, Michael Parr, 39, was taken to a Fargo hospital before being transferred to a Minneapolis hospital with back injuries. The driver, Brenda Schneider, 23, was treated at a Fargo hospital and released. The crash happened about 3 a.m. Monday. Bad weather prevented officials from flying Kandt to Fargo, Rask said. "So what do you do? You have to make that decision," she said. As of 4:30 p.m. Monday, troopers in the southeastern part of the state had helped 46 drivers whose vehicles were in the ditch or had other weather-related problems. "The lion's share of people are driving like it's icy," Prochniak said. "It's that 1 or 2 percent that are driving like they own the thing." The second punch of the storm could bring gusty winds and at least a foot of snow to some areas of the Red River Valley and the Devils Lake Basin, the National Weather Service said. A blizzard warning was in effect for those areas Tuesday. Schools in Grand Forks and Fargo canceled classes. Meanwhile, parts of the Midwest received up to 3 inches of rain over the weekend, and National Weather Service hydrologist Mark Fuchs said some regions in the three states could get another 2 to 2 ½ inches of rain by midday Tuesday. The Weather Service issued flood warnings in several states. Flood warnings extended along the river to Grafton, Ill., about 40 miles north of St. Louis, and forecasters extended the warnings to St. Louis on Monday night as storms continued dousing the region. "We were seeing substantial rises in the Mississippi yesterday," Fuchs said. "That combined with expected rainfall pretty much guarantees many places will get above flood stage." The worst of it along the Mississippi was expected at the Missouri towns of Canton and Hannibal and the Illinois town of Quincy. Moderate flooding was expected in all three communities. The Mississippi was at 12.4 feet Monday night at St. Louis, where flood stage is 30 feet. The Weather Service said the river is expected to top that level Saturday morning and rise by Sunday morning to near 31.5 feet - the point at which water begins entering a downtown parking garage. After a weekend of intense rainfall, authorities in northwest Ohio are bracing for the possibility of severe flooding. The Blanchard River in Findlay is expected to rise as high as 16 feet, enough for floodwaters to reach businesses in the downtown area. Scattered thunderstorms moved across the village of Ottawa Tuesday, and residents raced to pile sandbags in front of homes and storefronts in the midst of the third major flood in less than two years. Water crept into the downtown business district, and schools were closed as the Blanchard River was measured early Tuesday at nearly 6 feet above its flood level of 23 feet. While the National Weather Service indicated that the river was receding, forecasters cautioned of the potential for 1 to 2 inches of rain across the region through Tuesday night and the threat of more flooding in Ottawa and other low-lying areas across northwest Ohio's flat farmlands. Authorities on Monday declared a Level 3 road advisory for Putnam County, meaning anyone driving on water-covered roads could be arrested. The river crested at 31.7 feet during a flood in August 2007, the village's worst since 1913. Dozens of homes and business were damaged, and then-President George Bush declared the area a major disaster area. 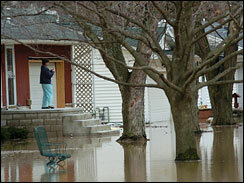 That was followed by another flood in February 2008 that saw the river reached 29.3 feet and caused more damage. In nearby Findlay, the Blanchard River crested about 15.4 feet Monday, about 4 feet above flood stage. High water had forced about 12 people to leave their homes for a Red Cross shelter. The weather service also issued flood warnings for the Sandusky River at Fremont and Tiffin and the Maumee River near Grand Rapids and at Waterville. On Sunday at least three tornadoes damaged or destroyed homes in parts of the Midwest. 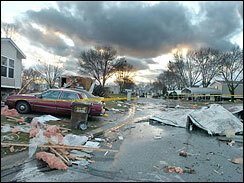 One twister struck a mobile home park in Columbia City, Indiana (left). Another destroyed a church and a farm house near Greenfield, Ill., about 60 miles north of St. Louis. A third tornado damaged or destroyed about 30 structures in the central Illinois town of Laomi. Three people suffered minor injuries. In northwest Ohio, high winds tore a roof off of one house, blew the windows out of another and damaged a barn near Defiance. The weather service was working to confirm whether a tornado had struck, meteorologist John Taylor said Monday. In Wellman, Iowa, a man was treated for hypothermia after his pickup truck ended up in a flooded ditch Sunday. A firefighter who rescued the man also required treatment. With more rain in the forecast across the region, officials were preparing for the possibility of further problems later in the week. When the storm hit southern Indiana on Sunday, it threw an empty school bus atop one flattened house in Lawrence County, and at least 19 houses were damaged. Scott Ramsey said the storm hit just as he was rushing into the basement. "I made it about to the third or fourth step down when I got blown down to the bottom," he said. In Bay County, Mich., high wind drove ice over seawalls and into homes along a stretch of Lake Huron beachfront. Authorities evacuated about 30 homes.